Every now and then, I would meet people who are knowledgeable about certain things, but they don’t see it as an opportunity to monetize from an eBook. When asked why, the common replies were “It’s just a hobby” or “It’s difficult”. Well, you’d be wrong to think that your hobby can’t be profitable and in this article, I am going to show how to sell an eBook easily right from a personal blog. This digital product is largely popularized by online marketplaces like Amazon Kindle where authors who already build a name for themselves, go to the platform to sell their work. But you don’t have to become someone popular or a prolific writer in order to sell an eBook. If you are passionate about a certain niche and could come up with a topic that spans 50 pages (or even less), that’s a good start. The new generation of eBooks calls for guides and how-tips where people can learn things in one compilation which is more time saving than having to search all over the web for scattered information. At any given niche, there are thousands of topics that people will always want to learn so that they can improve on their skills and knowledge. Here are just some of interesting keywords that I researched using Alphabet Soup Technique a few minutes ago. Through blogging, you can be unique within each of these topics and build a loyal audience without all the competition found on digital marketplaces. And since you are in control of marketing, you can offer the product at an affordable price and still keep most of the profit (after deducting from the payment processing fee). Of course, there are some technical learning curves involved – creating an eBook and planning the sales funnel – but once everything is set up, it basically runs on autopilot with very low maintenance. To make things easier, take a moment to digest this image flow. There are 3 points to work on in order to complete the purchase of an eBook; a sales page, a payment interface and a download page. We are going to set things up backward from here because it will make more sense that way. On WordPress media, upload the PDF ebook and note that there is a unique URL that goes with it. Now, create a new page and give it a title that one can immediately recognize as a download page. Provide instructions and an image (the book cover) and link the information to the PDF file URL that we have just created. When customers click on this, they will be able to download straight away. Although this page is part of your blog, you don’t want it to be accessible by the search engines. Otherwise, it’s going to get indexed and random people might find it and download your eBook for free. So before publishing, make sure that these SEO settings have been checked. A payment processing interface is basically a checkout page that looks something like this. It has an order summary and prompts the buyer to log into their PayPal account to complete the purchase. You don’t need to create this page; PayPal does it automatically when you create a buy button on your business account. When creating the button, you’ll be asked to “Take customers to this URL when they finish checkout”. 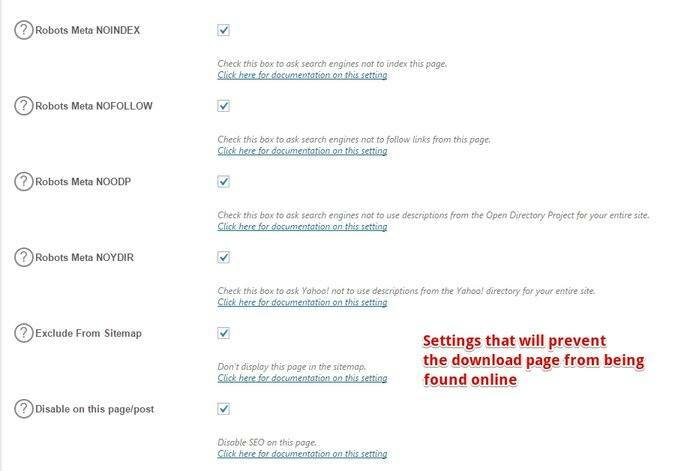 Here’s where you include the URL of the download page that we have created in the first step. After filling out the details, click on the create button and a code will be generated. We’ll be using this code in the third step. Back at WordPress, we need to create another page to promote the eBook. This page will likely carry an attractive title that resonates with the interest of your readers. Same as the download page, write some content that can provide insights and remember to highlight the benefits of buying the book. Use the same cover image to maintain brand consistency and find a good spot to place the buy button. Copy the code from PayPal and paste it in the HTML editor at where you want the button to appear. I know this could be confusing for some of you, so let’s walk through the entire process again, this time, from a customer’s perspective. Readers land on a sales page, like your description and click the yellow button to buy. They will see a PayPal interface and proceed to key in the details. After the payment has gone through, they will be redirected to the download page where the eBook is ready for viewing. Now that you know the technical side of things on how to sell an eBook online, the next step is to build traffic to your blog, specifically funneling readers to the sales page. By using targeted keywords to write relevant articles, readers will have a good reason to check out your offer so keep that in mind in your content creation moving forward. Yes, people might not buy immediately, but if you constantly engage with the readers, you’ll build trust and the audience will eventually discover the value of your product. I hope this article has got you pumped up about writing an eBook. If you like to learn more about growing an online business, please check out the training at Wealthy Affiliate. It has all the resources you’d need to get started. Have any thoughts or questions? Leave them in the comment below and I’d be happy to respond. You made the whole process so easy! But question, do I need Adobe to utilize this method? I ask because the file is uploaded as a PDF. What about a children’s eBook. Is that possible? I want to upload my own illustration. This is a very exciting way to earn money and share information you are passionate about. I’m going to give it a try. Hi Ririj, children’s illustration is a great idea for eBook creation. And yes, you’ll need the Adobe program to convert into PDF but that shouldn’t be too difficult. Let me know how it goes for your blog. Thank you for the awesome step by step. I have been a little uneasy about making an eBook; it just seems like so much work but also very exciting. I figured there would be a lot of typing involved but that’s as far as my head went. Will definitely be implementing this strategy soon. Thanks so much for this article Cathy! I’ve been thinking about doing an eBook as a giveaway to entice people to join my mailing list as well. But learning how to have it ready for sale is just as important. And I assume that the downloadable PDF file could be replaced with any other content, like video or audio as well? Yes, it could, but you need to ensure that the media format can supported by the recipient’s device in order to play the videos/audios. I find that this is more technically challenging as compared to PDF since most devices nowadays come with Adobe Reader program. 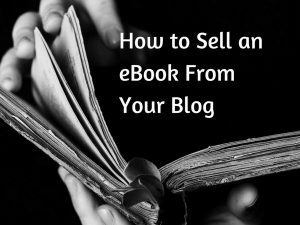 What a great explanation on how to sell an eBook from a blog! After reading this, I am brainstorming topics that I could create an eBook about. I did create a couple of them in the past and placed them on sale at Amazon but didn’t have much success with that. I think promoting from your own blog would generate more sales because of the targeted visitors. Your directions are really easy to follow. It is another great way to add an additional income stream for a niche blogger. Thanks for sharing this information! Writing an eBook has been on the back of my mind. The problem I always run into sitting down and writing that much into one project. Writing articles and posts on my website is easy, it only takes me 1 hour for a 700-word post. I guess it just takes stepping out and doing it. Thanks for showing how one can sell an eBook online. I will bookmark this post for future references.